The stock market's relentless santa rally grind higher on Friday put the Dow within a whisker of trading above Dow 18,000 for the first time ever! The trading session saw the Dow trade upto 17,991 by mid-day and then spend the next 2 hours flirting with a break above Dow 18k before trending lower into the close to still close at a new all time high of Dow 17,948. The end of the stock market world, crash is always coming perma bear crowd will have taken what they perceive as the satan rally and Friday's price action as a sign of FAILURE and thus the Dow HAS topped! Just as they have taken EVERY day that the Dow sets or retreats from a new all time high as THE TOP for the PAST 5 years! So will once more trundle out those long-term Dow charts, just as they have been doing for several years now to proclaim this is why this is the TOP - Looking at the distance from the 2007 top to now extrapolate where the Dow could next make its all time high some 10 years later AFTER an intervening bear market that never tends to materialise. It's not rocket science its approx $75 trillion dollars of global printed money, that' right $75 trillion! that the financial markets are leveraged to potentially by as much as X50!, that is a hell of a lot of INFLATION! People that cannot understand this should NOT invest let alone commentate on markets. THIS RALLY is as a CONSEQUENCE OF THE INFLATION MEGA-TREND - Rampant money printing inflation, be it that the printed money is called government DEBT, QE or any other of a infinite number of government and central bank money printing schemes. 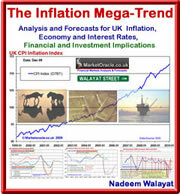 Understand this - THERE CAN NEVER BE DEFLATION! It is an ILLUSION of minds stuck in a fantasy land of theoretical models where our current stocks bull markets just cannot exist. Central bank money printing is what dark matter is to the structure of the universe! For if it did not exist then yes we would have deflation but not only does it exist but its quantity is near infinite! Whilst I may regularly ridicule the perma bears, in reality I find their high pitched top is in screaming commentary very comforting for as I have often pointed out that as long as the perma-crowd don't throw in the towel in a fit of collective amnesia and turn bullish then the stock market should continue to grind its way ever high. However, on that note I am seeing some worrying signs of some of the perma-clueless that were never bullish for years and years when stocks were cheap apparently have started to slowly turn bullish. I see this manifesting in commentary implying that this could be one of the greatest bull markets in history. Something that I have voiced for the past FIVE YEARS as iterated in hundreds of articles and several ebook's in the Inflation mega-trend and stocks stealth bull market series (FREE DOWNLOAD). Bears turning bullish is not what I want to be hearing from the perma-crowd, that's not the script they are meant to follow! Which means its going to be much tougher ahead unless the market gives the bears some rope to hang themselves with i.e. a significant correction. Now, rather than the Dow breaking above 18k by the end of December and leaving aside the 10 years from now perma bear mantra, the Dow is clearly probably going to achieve Dow 18k far sooner which could be even as early as Monday morning! Technically the Dow is STILL over bought but marginally LESS than it was some 3 weeks ago and some 300 points lower as the slow climb higher has acted to unwind a little of the overbought state. The question is what happens next ? Can the Dow continue to grind its way slowly higher all the way into the end of the year. Sure it can, is it probable? That is tough because current market behaviour just reeks of obvious in your face market manipulation far beyond that which I model for in my trend analysis. Technically the market needs to correct NOW, but the market is in the grip of santa mania as it appears determined to imminently set a new all time high above Dow 18k. In my opinion the stock markets relentless climb higher is setting itself up for a more significant EARLIER correction, which means that it is increasingly looking likely that the January correction could start BEFORE the end of this year. I'll come back to a more in-depth analysis of the stock market before year end so ensure you are subscribed to my ALWAYS FREE Newsletter to get this and other on going in-depth analysis and detailed trend forecasts in your email in-box, but I will leave you with this closing thought, those looking for an end of the bull market during 2015 will still be looking for the top by this time NEXT YEAR when we will probably be wondering whether the Dow will break above 20,000 before the end of the year! I have a loaded series of questions. Forgive me as I may not be able to articulate what I feel about the markets. I trust they make sense and you can share some thoughts. Q1) The ratio between USA and UK has widened considerably with a USA bias. Over the last 5 years that is approximately +20% (FTSE) and +65% (DJIA). Today, this FTSE/DJIA ratio gap seems unprecedented and I can't help to think that this ratio gap needs to close as it did when recovering from tech-crash 10yrs back. I mean the FTSE hasn't really done anything for 18 months. I'm guessing that the answer lies in terms of the relative sector/industry weights for FTSE/DJIA. Maybe? The numbers say that the FTSE should be at around 7500 today but I would like to understand some of the reasons why it isn't. Dare I say that the UK haven't copied America? If the DJIA plays with 20,000 then surely the FTSE needs to be closer to 10,000 as history has always reverted to an approximate 50% ratio between them. I'm being crude but your opinion will help. 2) If you agree that the FTSE needs some torque then which sectors are likely to drive this Torque? 3) Is there a link between Oil price and QE? Oil/Oil Service companies are losing weight and bricks/mortar are fattening up? How can I tie this all together?